Bella Electric Strings, led by rock violinist and arranger Nina Di Gregorio, has rocked audiences worldwide with their blistering solos, unique arrangements--not to mention their beauty and charm. The girls have performed with some of the biggest names in the business, from Beyonce to Shakira to Andrea Bocelli, and have appeared on America's Got Talent Season 1. Bella Electric Strings were recently featured in a “David Foster and Friends” concert alongside the legendary songwriter and producer. The girls perform on Yamaha instruments and their music can be heard during many Yamaha String Educator clinics. Also this year, the girls were the featured string quartet for Richard Marx, backing him up for his Las Vegas all acoustic show. The girls comprised most of the string sections for both the Yellow Brick Road Symphonic Rock Show as well as legendary rockers Deep Purple, at the Pearl Theatre in Las Vegas. They keep a busy corporate schedule, and are one of the most sought-after acts in North America. 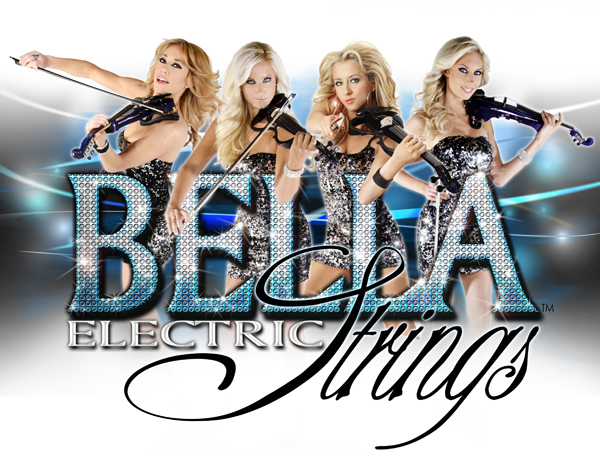 Bella Electric Strings is capable of performing for a wide variety of venues and events. From corporate feature act, to weddings, to 75 minute headlining stage show complete with video, lights, music, choreography, and comedy…these girls do it all. They can perform acoustically for a laid back setting, showing off their classical roots…or rock the roof off of the place with their high-energy backing tracks. Their music spans from original tunes, to classical, to classic rock, to top 40 and even heavy metal. These girls have taken the time to truly master each genre of music. Aside from performing as a trio or quartet with backing tracks, the girls also perform with a live band…anywhere from just guitar, to a full “Bella Rockestra,” including horn section, 4 singers, and 5 piece backing band….and everything in between! Please contact us about show options, pricing, and song lists.